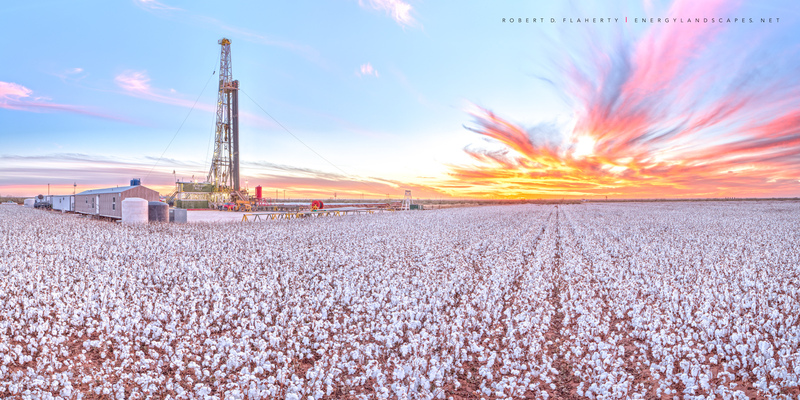 "Tall Cotton" features Sendero rig 6 drilling a short vertical well for Pioneer Natural Resources near the small farming comunity of Tarzan Texas. The emphasis here is the detail in some of the best looking cotton you will ever see. The camera was mounted in a vacuum enclosure 110 inches above ground level. The use of a perspective control lens means that each bowel of cotton is perfectly in focus from foreground to horizon as well the drilling rig and spectacular late November sunset. The image is composed of 4.24 billion pixels and is engineered to be a 12x24 foot fine art mural.